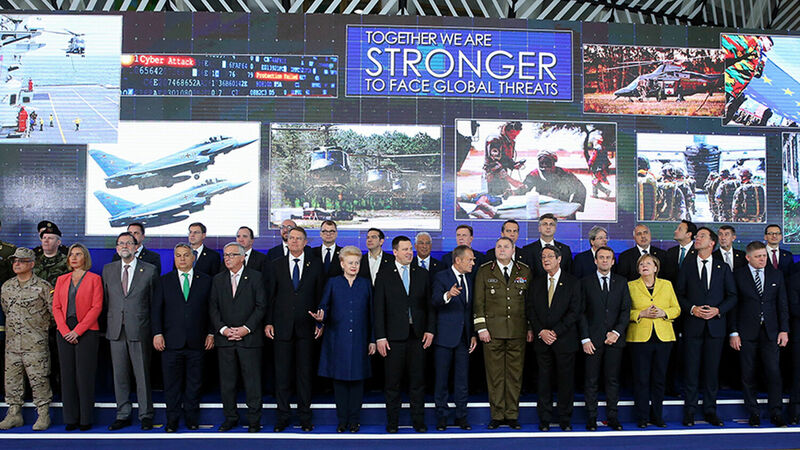 European leaders and PESCO commanders of defense attend the first session of the European Summit of the Heads of State and Government of the European Union in Brussels on December 14. A few weeks ago I visited Blenheim Palace. The palace was a gift of the grateful nation to one of Britain’s greatest-ever generals: the Duke of Marlborough. The whole place is a monument to Marlborough and is full of pictures of his greatest achievements. To me, one stood out among all the heroic poses, great victories and defeated enemies on display. Part of a series of tapestries commissioned by the Duke to celebrate his victories, it is a 15-foot-high celebration of Marlborough’s carts. Other tapestries show the surrender of French generals, Marlborough sending out orders in the heat of battle, or troops preparing for a fight (you can see all the tapestries here). But in this one, the lowly horse and cart is the star. This tapestry was included for good reason. War is about death and glory charges, personal heroism and brilliant tactics. But it is just as much about the boring details—such as the logistics of getting the right concentration of well-fed, well-armed men to the right place at the right time. Marlborough’s cart was a new design that allowed his army to speed across Europe. It deserves its place on the victory tapestries. This is why just about anyone who is anyone in the history of war has a pithy quote on logistics: from Sun Tzu (“The line between disorder and order lies in logistics …”) to Alexander the Great (“My logisticians are a humorless lot … they know if my campaign fails, they are the first ones I will slay”) to Gen. George Patton (“Gentlemen, the officer who doesn’t know his communications and supply as well as his tactics is totally useless”). It’s not just the devil that is in the details—the great general is there too. I was reminded of this looking over the EU’s latest plans for military cooperation. There’s nothing dramatic, eye-catching or heroic in these agreements. It’s called pesco—an acronym vaguely derived from the term Permanent Structured Cooperation—which sounds more like an accompaniment to pasta than anything dangerous. But it gives Europe the ability to work on those details involved in forging a European army. A combined European military would be earthshaking. It would produce a new superpower overnight. In fact, the EU is already a superpower—it just lacks this military dimension. pesco pushes EU nations to boost their defense spending. It gives them a way to work together on weaponry. And it will help them integrate their forces. The initiative officially launched last Monday and then again on Thursday, this time by heads of government. It includes 17 projects—many of which deal with these boring details. Germany, for example, will take the lead in the creation of a project called “The Network of Logistic Hubs in Europe and Support to Operations.” The idea is to help European forces move across borders more easily. This adds to the European Air Transport Command that has already been set up. Germany will also lead a project to create a European Medical Command to help nations work together in aiding and rescuing the wounded. And they’ll lead another to train military trainers. Perhaps more important than these specifics is the fact that the EU now has a mechanism to keep working together. pesco allows the EU to add more projects, so it will be able to continue working on more of these boring details. Germany is now working on an EU military on two fronts. It has deep cooperation with a handful of nations: Around two thirds of the Dutch Army is now under German command and German leaders are working on a similar deal with the Czechs and Romanians. It is pioneering cooperation with a few nations, and it now has a mechanism to apply it on a wider basis. The EU is the world’s second-largest economy and the center for global trade. It accounts for 15 percent of the world’s military spending, giving it the world’s second-highest defense budget. Those statistics alone should make these efforts to consolidate into a unified military a big deal. Even a cursory understanding of Europe’s history should also cause people to take note of what is happening. But Bible prophecy gives even more dramatic warnings. So much of what Mr. Armstrong wrote about this European power has already happened. It has a common currency—just like he said it would in the April 1980 Plain Truth. It has absorbed nations that used to be behind the Iron Curtain, as he said it would in January 1957. And it is dominated by Germany, as he wrote in November 1954. It’s only a matter of time before it develops the “common military force as great or greater than either the ussr or the U.S.A.” that Mr. Armstrong wrote about. Yet these prophecies also tell us something far more important than what is going on in Europe. The fact that pesco and all the other events going on in Brussels are forecast in detail in your Bible carries an important lesson. The greatest general of all is involved in these details. He prophesied all of these developments thousands of years in advance. You can get to know many of these prophecies by reading our free booklet He Was Right. By doing so, you can better come to know the great God who made them—the God who foresaw these details thousands of years in advance and who is now bringing them to pass. The greatest reason to study these prophetic details is so that you can get to know that powerful Almighty God!